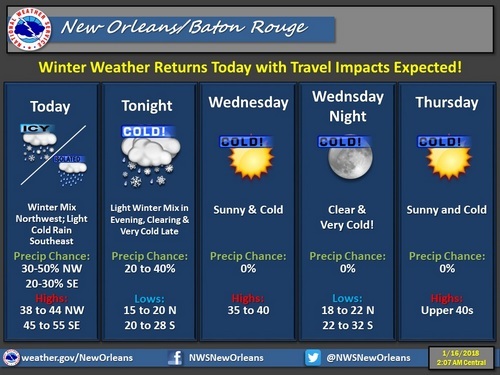 Among another blast of unusually cold weather, forecasters are predicting a possibility of snow as part of the below-freezing temperatures expected in New Orleans Tuesday night, according to the National Weather Service. Temperatures will fall toward freezing and plunge into the 20s overnight, and the precipitation expected could result in snow, sleet or freezing rain, according to the National Weather Service. The cold weather will repeat again on Wednesday, but without the precipitation. Forecasters are also warning of a return of the dangerous wind chill that New Orleans has seen in other recent cold snaps. “Temperatures will quickly drop below freezing and with winds of 10 to 20 mph expected wind chill readings in the single digits to lower teens are anticipated across the entire region,” the warning states.